The Hammerscar Plantation appears in the centre of the frame about one third of the way up. A tiny part of the path to Silver How can be made out just to its right. 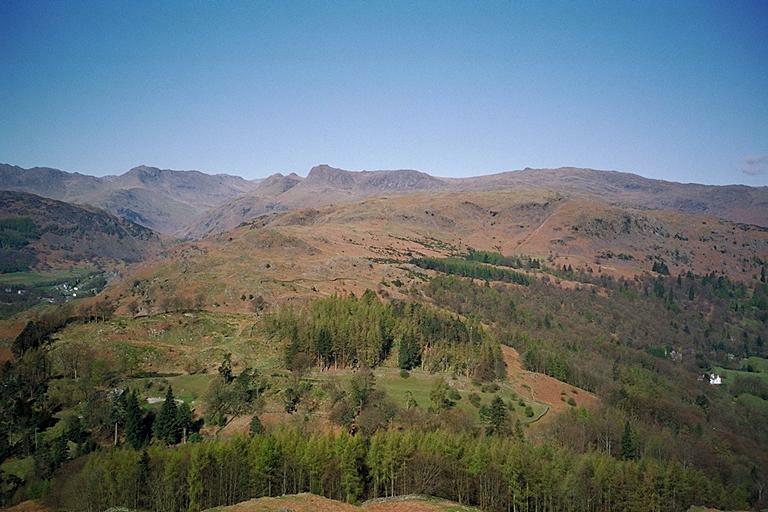 On the horizon, from the left, are: the slopes of Crinkle Crags, Three Tarns (with Scafell behind), Bowfell, Esk Pike, a glimpse of Great End, the Langdale Pikes (Loft Crag, Pike o'Stickle and Harrison Stickle), Pavey Ark, Sergeant Man and High Raise. Smaller version of this picture.